To artist or non-artist, the creative process often seems mysterious and magical. How do we give a physical reality to our inspiration so it communicates its essential nature? 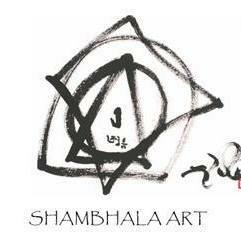 Shambhala Art’s purpose is to explore the creative process and the product we call art, from the viewpoint of a meditative discipline. It is a viewpoint that encourages us to see things as they are, rather than just how we think or imagine they are and to bring wakefulness and awareness to the creative and viewing processes through the integration of contemplation and meditation. 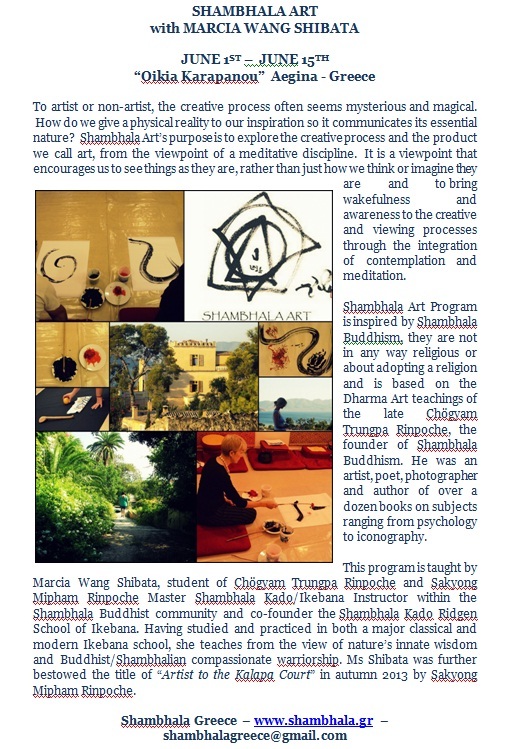 Shambhala Art Program is inspired by Shambhala Buddhism, it is not in any way religious or about adopting a religion and is based on the Dharma Art teachings of the late Chögyam Trungpa Rinpoche, the founder of Shambhala Buddhism. He was an artist, poet, photographer and author of over a dozen books on subjects ranging from psychology to iconography. 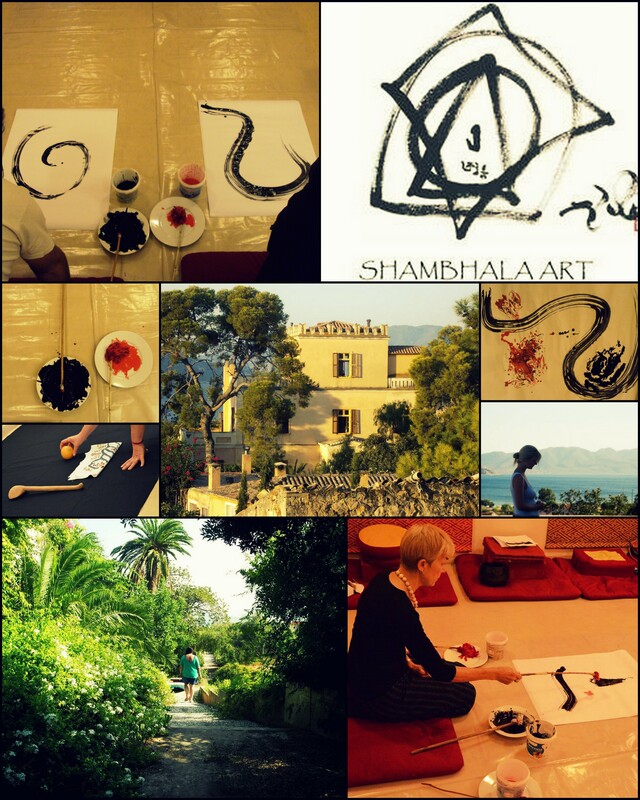 This Art + Life Retreat will include all 5 parts of the Shambhala Art training program. It will provide an opportunity for artists and non-artists alike to experience creativity and its genuine expression in all aspects of our lives. The retreat includes teachings, meditation, awareness exercises, plus creative and group processes that help unlock a non-conceptual sense of expression that is available to us all. In many traditions, artists train not only in their disciplines; they also train in awareness, confidence, and compassion. The program draws from the teachings on the creative process developed by Tibetan meditation teacher Chögyam Trungpa Rinpoche, who said to artists, “You could play a tremendous role in developing peace throughout the world.” In our work together, we’ll build our capacity to do so and to share our inspiration with others. This entry was posted in ΤΑ ΝΕΑ ΜΑΣ and tagged Amrcia Wang Shibata, Sandra Ladley, Shambhala Art on January 24, 2018 by Olga_Papalexandrou. This entry was posted in ΤΑ ΝΕΑ ΜΑΣ and tagged Aegina, Marcia Wang Shibata, Oikia Karapanou, Shambhala Art, Summer 2018 on October 29, 2017 by Olga_Papalexandrou. 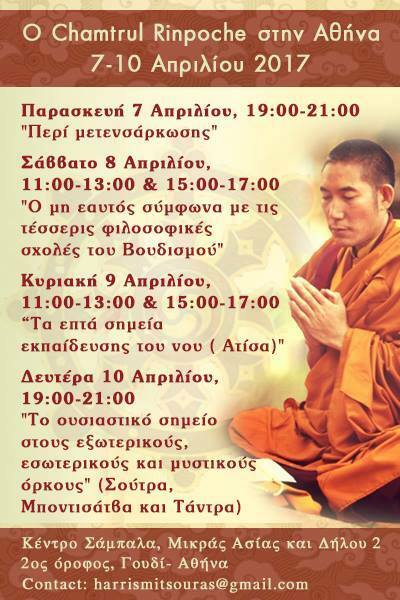 This entry was posted in ΤΑ ΝΕΑ ΜΑΣ and tagged Chamtrul Rinpoche, Τα νέα μας on April 3, 2017 by Olga_Papalexandrou.